You know those “snowplow parents” — the ones who clear away impediments that might hamper their children’s success? They’re getting their comeuppance in the wake of the recently discovered college entrance cheating scheme that has snared celebrities like Felicity Hoffman and Lori Loughlin and revealed the corrupt ways parents of means can push aside those inconvenient test scores or other qualifications to get their kids into college. That’s clearly unfair and must be stopped. But when it comes to solving the persistent gender pay gap, the snowplow strategy is exactly what’s needed, and urgently so. 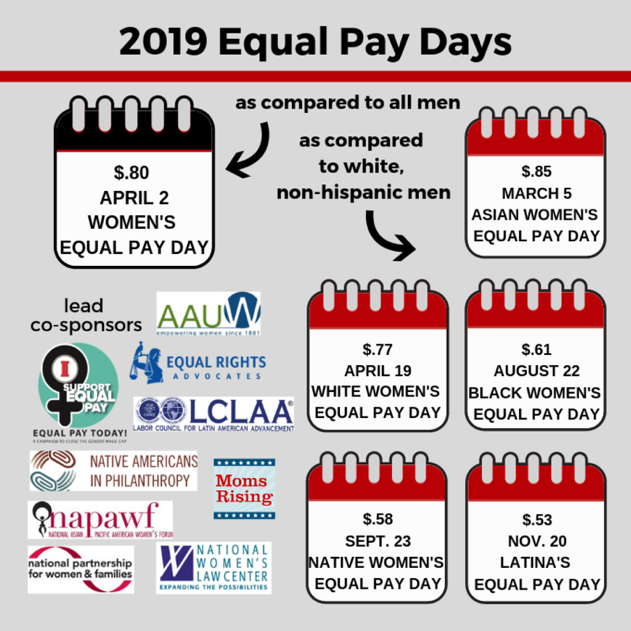 Women on average, still in 2019, are paid 80 cents to every dollar earned by men, and within that egregious statistic, women of color earn a paltry one-half to two-thirds of what white men earn for the same work with the same experience. Are you angry enough yet? The glaring injustices seriously deserve to be snowplowed. It’s not like women haven’t tried through the legal system. The legal struggle for equal pay has a long history. 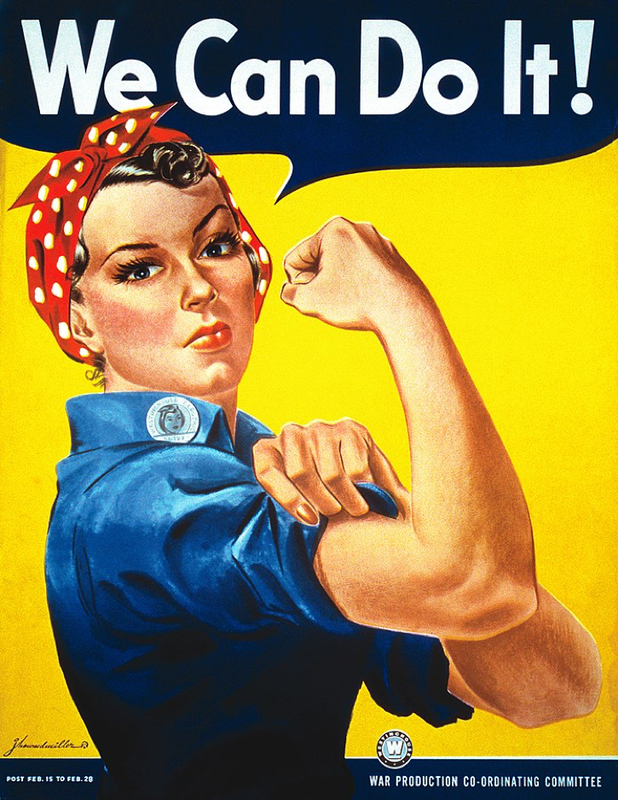 The first Federal policy supporting equal pay began in 1942 when the War Labor Board ruled that women (remember Rosie the Riveter who went into paid employment to support the war effort when the men went off fight World War II?) had to be paid the same rate as men had been before they vacated their jobs. This didn’t do much good, since when the men did return, the women were for the most part sent packing back home. President John F. Kennedy signed the Equal Pay Act in 1963. It was expanded in 1972 to include a number of previously exempted professional categories. In 2009, President Barack Obama made the Lily Ledbetter Fair Pay Act symbolically the first bill he signed into law. But this law merely extends the time limits when an employee can file an equal pay discrimination lawsuit. Just this past week, the U.S. House of Representatives passed the Paycheck Fairness Act. But it’s not likely to pass the Senate or receive presidential approval that would make it the law of the land. Obviously, laws alone won’t solve the problem. It’s going to take a triple whammy snowplow to disrupt the trifecta of policies, practices, and deeply embedded cultural biases. April 2 is Equal Pay Day this year. Here’s how we can disrupt those impediments and escalate progress toward equal pay for all, men and women of all backgrounds. Unless we want to be condemned to having this same conversation for the next 10 years, or 70, or 150 depending on who you ask, then here are the three snowplow strategies we must employ simultaneously — and immediately. 1. Top down systems change. There’s no question that continuing to pursue laws at all levels is essential, though maddeningly slow. We’re seeing more action at the state levels for public policies such as banning questions about compensation history in job applications, requiring companies to report wages by gender, and raising the minimum wage since women are disproportionately represented in lower paying jobs. Company policies can play as influential a role as government policies; they don’t have to wait for laws to be passed to implement processes that bring more transparency and fairness to compensation practices. They can follow the lead of companies like Salesforce, Intel, and Starbucks that have made a commitment from the top to close their wage gaps, done the necessary studies, and invested in removing disparities. And technologies such Pipeline’s artificial intelligence software can help to squeeze biases out of company promotion and compensation systems. Bam, wage gaps closed — that was easy! 2. Women: Clear our heads, know our worth, and ask for it. I increasingly focus on what implicit bias does to our heads and behavior when I’m speaking or training. This is because the social cost to women of negotiation is high, and the result is that we simply don’t ask as aggressively as men do. As Carnegie Mellon professors Linda Babcock and Sara Laschever discovered in their research and wrote in their book Women Don’t Ask, women are half as likely as men to ask for what they want, value their own work almost 20% less than they value the work of others, and in experiments work 22% longer than men before they think they have earned their pay. Match that disparity with the 20% pay gap, and it’s obvious why we need to understand the effects of implicit bias on our behavior in order to snowplow it out of our heads. The next step is to get grounded in the marketplace so that we know our worth. And lastly, turn Equal Pay Day into Equal Ask Day, because let’s face it, she who asks gets and she who doesn’t is likely to get left behind, cumulatively earning an average of $500,000 less over her lifetime simply because she didn’t ask for what she was worth. The presence of prominent women who are mothers in the workplace normalizes this almost universal human life event. More companies are providing lactation rooms and flexible work time, but how about women asking for affordable quality childcare? 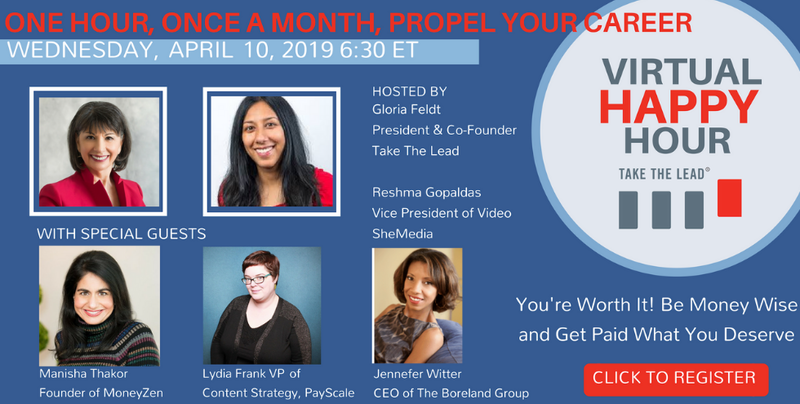 Be sure to join me for Take The Lead’s monthly Virtual Happy Hour April 10 to learn from some experts how to get a good relationship with money and parlay that to equality in your paycheck. Reserve your spot at this month’s Virtual Happy Hour here! 3. Bring everyone into the story so everyone will be part of the solution to the pay gap. Actually, everyone is already in the picture whether they know it or not. 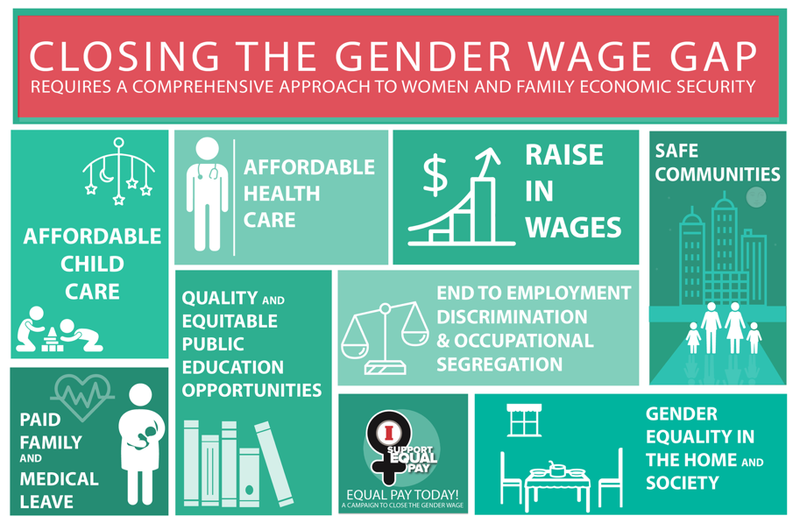 Consider: Equal pay would pump $512.6 annually billion into the U. S. Economy, cutting poverty by half. Globally, McKinsey & Company projects that $12 trillion would be added to the economy by advancing women’s equality including pay parity. 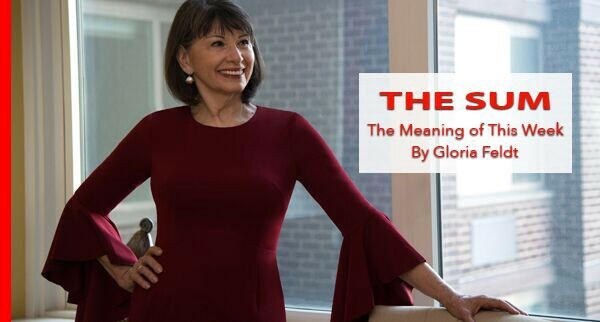 Since 40% of American women are already the primary or major breadwinners in their families, it matters profoundly to the family economy whether the woman of the house gets paid equally to a man holding her same position. We don’t have to accept the status that has stayed so quo for so long. We’ve seen that it isn’t possible to increment ourselves to success. So rev up those snowplows and let’s get going.